For many Americans the mention of Africa immediately conjures up images of safaris, ferocious animals, strangely dressed "tribesmen," and impenetrable jungles.Although the occasional newspaper headline mentions authoritarian rule, corruption, genocide, devastating illnesses, or civil war in Africa, the collective American consciousness still carries strong mental images of Africa that are reflected in advertising, movies, amusement parks, cartoons, and manyother corners of society. Few think to question these perceptions or how they came to be so deeply lodged in American minds. Mistaking Africa looks at the historical evolution of this mind-set and examines the role that popular media plays in its creation. The authors address the most prevalent myths and preconceptions and demonstrate how these prevent a true understanding of the enormously diverse peoples and cultures of Africa.Updated throughout, the fourth edition covers the entire continent (North and sub-Saharan Africa) and provides new analysis of topics such as social media and the Internet, the Ebola crisis, celebrity aid, and the Arab Spring. 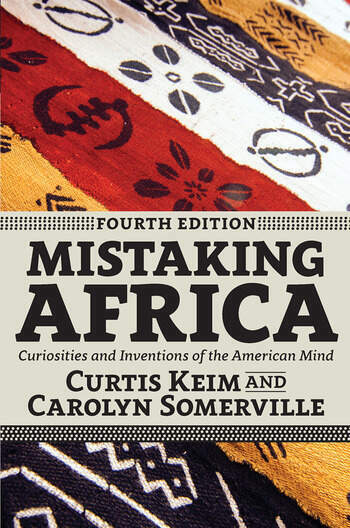 Mistaking Africa is an important book for African studies courses and for anyone interested in unraveling American misperceptions about the continent.